The types of hearing loss are classified by the part of the ear that is damaged or not functioning correctly. Hearing loss caused by problems in the outer ear and/or middle ear are referred to as conductive hearing loss. When the cause is problems with the inner ear (cochlea) it is referred to as sensory hearing loss, and when caused by the auditory nerve it is referred to as neural hearing loss. It most cases, sensory and neural hearing loss are grouped together and referred to as sensorineural hearing loss. Conductive hearing loss describes hearing impairment in the outer ear or middle ear. It occurs when the sound vibrations cannot be conducted to the inner ear (the cochlea) through the outer and middle ear. You can easily mimic conductive hearing loss by simply plugging up your ears with your fingers – and there you have it! You will be able to understand speech, but only if it’s loud enough and if the background is not noisy. In many cases, and depending on the degree of hearing loss, a bone conduction implant – like the Baha 5 System – is the recommended treatment. Typically occurring as you get older, although people can be born with this type of loss, sensorineural hearing loss affects the inner ear – the cochlea, or the auditory nerve. People who suffer from sensorineural hearing loss might perceive sounds, but they don’t always understand what people are saying. Single-sided deafness falls under this type of hearing loss, describing unilateral profound sensorineural hearing loss – no hearing or very little hearing in one ear, and normal hearing in the other ear. 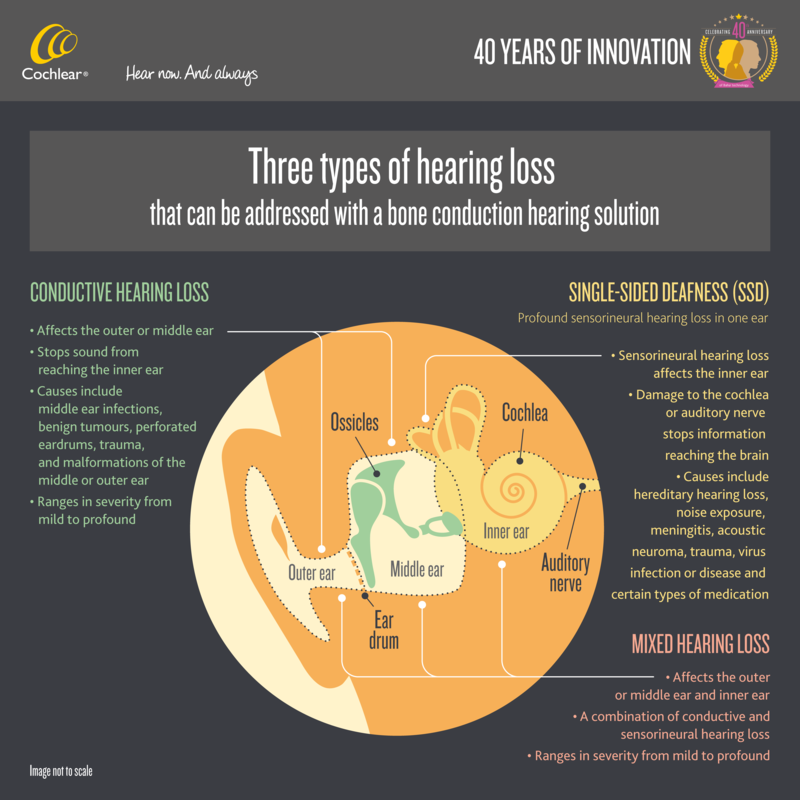 This type of hearing loss is typically treated with a bone conduction system. This type of hearing loss is a combination of conductive and sensorineural hearing loss. Damage in both the outer or middle ear and in the inner ear is present. This type of hearing loss ranges in severity from mild to profound. People who suffer from mixed hearing loss describe sounds as being both softer in volume and more difficult to understand. Mixed hearing loss can also be treated with a bone conduction system, depending on the degree of hearing loss. In the next article, read about the bone conduction solutions recommended for the treatment of conductive hearing loss, mixed hearing loss, and single-sided deafness. Disabling hearing impairment affects more than 360 million people – over 5% of the world’s population, according to the World Health Organisation (WHO). In less than 30 years, the estimated number of people affected by hearing disability had skyrocketed from 42 million in 1985 to about 360 million in 2011. WHO also warns that 1.1 billion young people (12-35 years) are at risk of hearing loss due to recreational noise. WHO defines disabling hearing loss as “hearing loss greater than 40 decibel (dB) in the better hearing ear in adults and a hearing loss greater than 30 dB in the better hearing ear in children”. Identifying the early signs of hearing loss is of crucial importance not only for the ones affected, but also for the global economy, which sees 750 billion international dollars lost to unaddressed hearing loss. Interested in learning more? Check out the WHO 2017 report on the impact of hearing on the global economy. The Baha® 5 and Baha® 5 Power sound processors are developed, designed and shipped from Sweden worldwide, but did you know they are also manufactured and assembled here too? The concept, design, development, testing, manufacturing, packing and logistics are all done under one roof! Meet some of the great people who work together to design, test and manufacture the Baha System at Cochlear Bone Anchored Solutions. These are the people who make sure that all details are perfectly put in place so that the sound processors meet all requirements. It takes less than thirty minutes to produce one sound processor, and every fourth minute a new unit is packed and ready to be shipped! 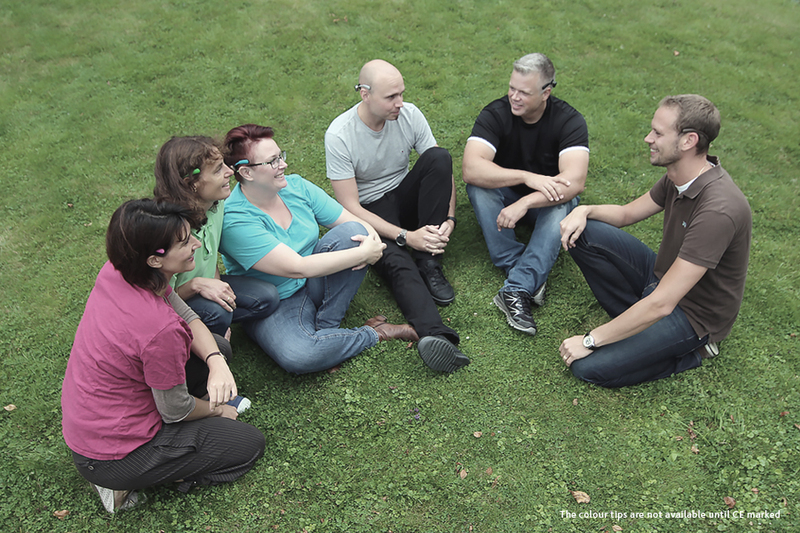 Our team of audiologists and acoustical engineers are the ones who make sure that the Baha 5 sound processors and accessories are adapted to the specific needs of the recipients. By meeting hundreds of people every year to evaluate the hearing performance and benefits of the implant systems. They also manage sponsored clinical trials of the Baha system at clinics all around the world, including the largest ever clinical investigation undertaken for bone conduction hearing implants – an ongoing project that involves seven countries across Europe! Our Implant Engineers and Acoustic System Engineers are a small part of the team who design, develop and test our implants and sound processors, making sure that each individual component is fine tuned and works together as an entire Baha System. Have you ever wondered how the features of your sound processor and implant have been developed to meet your needs? Our Product Managers have a fundamental role in ensuring the voice of the customer is at the centre of all sound processor and the implant system development. From meeting with users, audiologists, ENT surgeons and educating professionals, to establishing close collaborations with research teams all around the world, they help drive product innovation that makes a difference to the lives of the people who rely on a Baha System to hear each day. 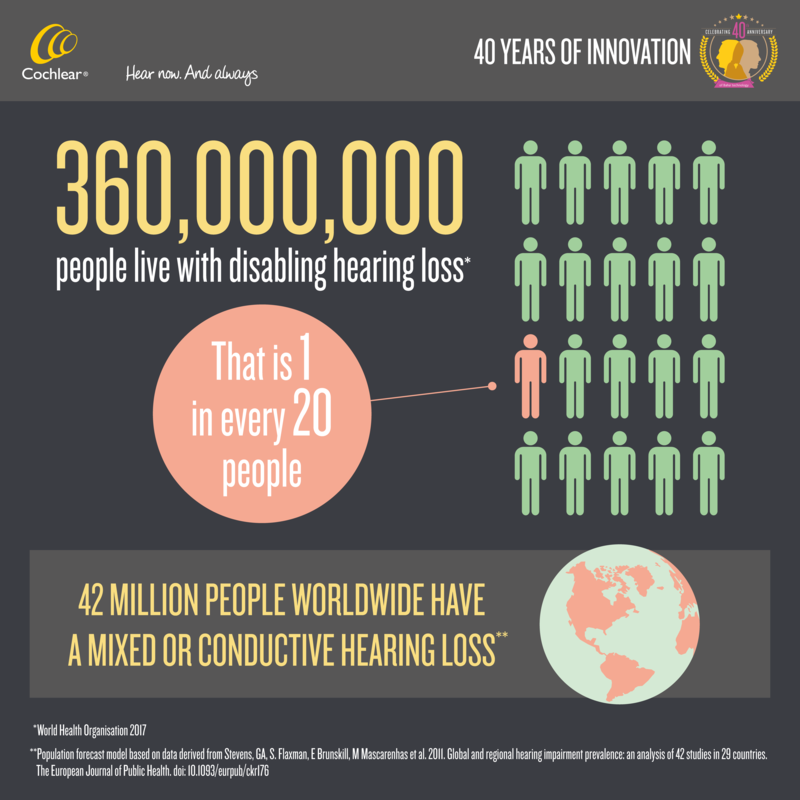 Happy 40 years anniversary from our entire team at Cochlear Bone Anchored Solutions in Sweden!